This is your opportunity to own land in what has become one of the most developed stretches of Highway 81 North. Up for lease is a prime four acre parcel with 300 feet of frontage on one of Andersons gateway highways . . . Highway 81 North. This property was previously used as residential. The home is a 2,627 sqft brick home with 3 bedrooms and 2 full baths. The home features a large family room, formal living and dining, with a triple garage and two outbuildings. The owner has updated the interior for office use; however it could still be used as a home or combination of the two. This property is located just north of T.L. 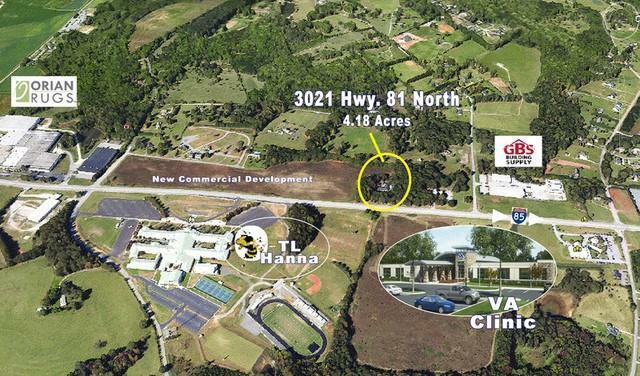 Hanna High School, only 175 yards from the East West Connector and is across from the new VA Hospital. Easy access to I-85. This property adjoins a previously sold tract which is just now under development. Property in this area and size is rare making this a desirable investment parcel or attractive development opportunity. This area is continuing to grow FAST! Property is just outside of the city limits and is zoned C-2 which is established for development of businesses serving major thoroughfares and includes all uses permitted in C-1 as well. Listing provided courtesy of Jimmy Johnson of Coldwell Banker Durham & Assoc.